Download "SNEDEN MBA PROGRAM Donald W. Maine School of Business"
4 Admission Requirements the Personal MBA Graduate application and nonrefundable application fee. Bachelor's degree from a U.S. regionally accredited institution or accredited international institution with an overall G.P.A. of 2.75 or higher (on 4.0 scale). Official transcripts from all colleges/universities previously attended. Current resume and copies of professional certification(s) Two letters of professional recommendation (forms provided by D.U.). GMAT scores must be submitted (include scores for Verbal, Quantitative, Total, and Analytical Writing). Davenport University MBA concentrations: Accounting High-achieving students come to Typically, our MBA classes average 10 Health Care Management Davenport from many different to 15 students. So you won t get lost or Human Resources Management 5 backgrounds and experiences. Attitude and drive are more important to us than overlooked in a super-sized lecture hall. Small class size is a big advantage, because Strategic Management 6 a heavy load of undergraduate business it provides a more informal and interactive classes. Our wide range of students, cultures, and backgrounds makes for an interesting MBA experience for all. We welcome nonbusiness as well as business majors. atmosphere where you can really get to know your classmates and develop longlasting associations. Specialized Curriculum Davenport s MBA is unique in that you receive advanced learning in specialized areas. Each concentration provides in-depth learning in that subject and provides a strong management/ leadership orientation. After completing the MBA core courses, Human Resources Management This concentration addresses the challenges that human resource managers face in the 21st century, including changes in laws and public policy, theories of organizational you will have six courses in your MBA concentration. 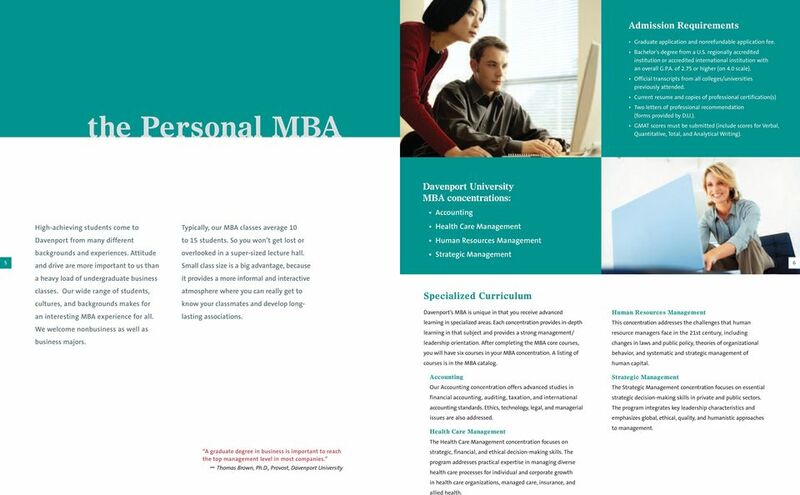 A listing of behavior, and systematic and strategic management of courses is in the MBA catalog. human capital. Accounting Strategic Management Our Accounting concentration offers advanced studies in The Strategic Management concentration focuses on essential financial accounting, auditing, taxation, and international strategic decision-making skills in private and public sectors. accounting standards. Ethics, technology, legal, and managerial The program integrates key leadership characteristics and issues are also addressed. emphasizes global, ethical, quality, and humanistic approaches Health Care Management to management. The Health Care Management concentration focuses on A graduate degree in business is important to reach the top management level in most companies. Thomas Brown, Ph.D., Provost, Davenport University strategic, financial, and ethical decision-making skills. The program addresses practical expertise in managing diverse health care processes for individual and corporate growth in health care organizations, managed care, insurance, and allied health. 5 Foundation (Prerequisite) Requirements To succeed in our MBA program, you should have a solid foundation in business classes prior to entering MBA classes. If you have a business undergraduate degree, you are probably ready to start. If not, you may be required to take some prerequisite classes in accounting, finance, management, marketing, or statistics. Core Courses Each of our concentrations has six core courses that provide advanced learning in organizational development/culture, business analysis, marketing strategies, managerial accounting, managerial economics, and financial management. Capstone Course Your capstone course culminates your MBA program. You ll work with your faculty advisor to choose a project relevant to your career or concentration. It is a rewarding way to finish your MBA and often provides you with immediate value to your career. Affordable If you are determined to earn your MBA, we don t want financial need to get in the way. There are two ways to get financial aid. 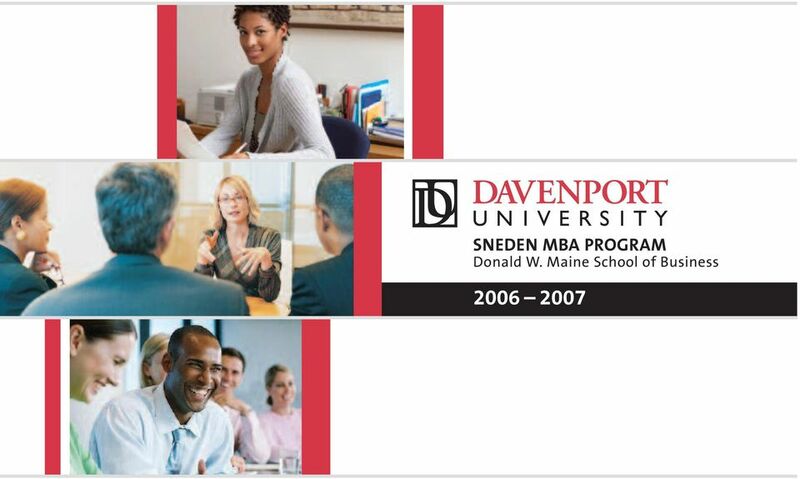 Convenient Now that you know more about Davenport University and our MBA, we hope we have convinced you to apply to our Sneden MBA Program. We are committed to helping you expand your horizons, further your education, and more importantly, advance your career goals. 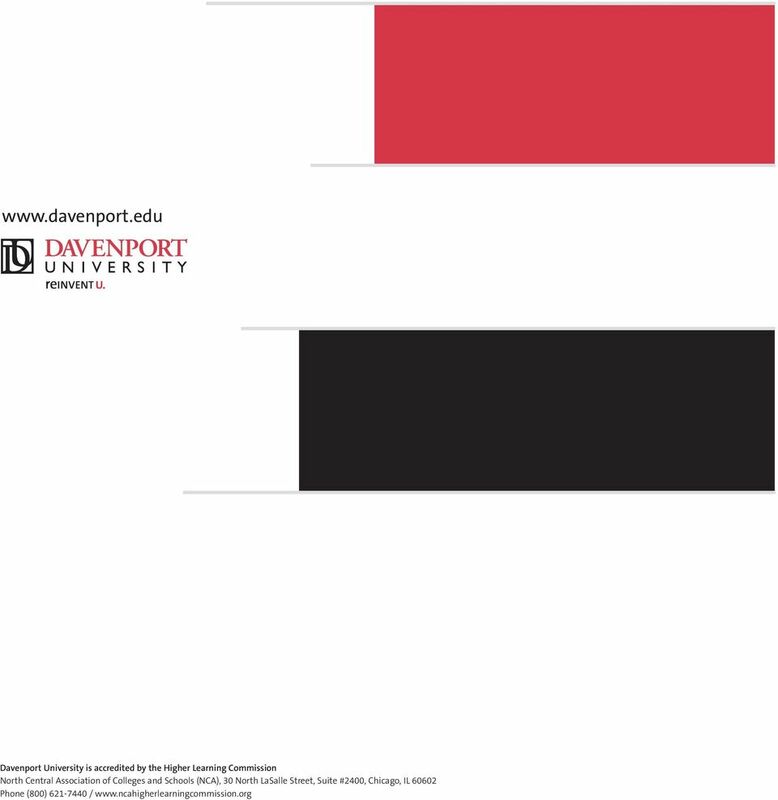 Davenport University has a business-focused curriculum comprised of the skills that today s business leaders have told us they value most in their employees. You will find that Davenport University s Sneden MBA Program is designed to prepare managers and other professionals to assume greater responsibilities and excel in their careers. Davenport offers an outstanding support system to enhance your MBA learning. We applaud your desire for attaining this degree and your willingness to work hard. We take great pride in helping you achieve the skills and talents necessary to succeed in the classroom and the workplace today. 7 One, your employer may reimburse you for MBA courses. Two, Our Sneden MBA Program faculty is not only qualified academically, but many are business executives or run 8 Davenport can help arrange financial aid for you. So don t let their own businesses. We believe this superior blend of academic excellence and real-world experience will financial need slow down your career moves. We won t. For deliver a more practical and valuable preparation for your career. information on student financial aid, go to Thank you for your interest in Davenport University. I am confident you will find an environment that fosters learning, team building, and personal growth that will have a lifelong impact. We look forward to helping you achieve your career and personal goals. We invite you to Davenport University! At Davenport you don t have to give up your family, hobbies, or job to get an MBA. You could earn your MBA in as little as 18 months going to class during the week, on weekends, or online. We want to make earning your MBA as convenient as possible. 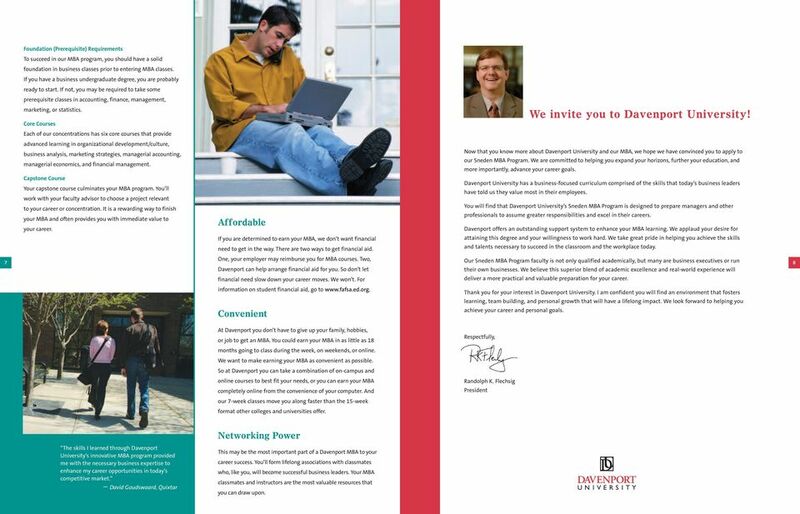 So at Davenport you can take a combination of on-campus and online courses to best fit your needs, or you can earn your MBA completely online from the convenience of your computer. And our 7-week classes move you along faster than the 15-week format other colleges and universities offer. Respectfully, Randolph K. Flechsig President The skills I learned through Davenport University s innovative MBA program provided me with the necessary business expertise to enhance my career opportunities in today s competitive market. David Goudswaard, Quixtar Networking Power This may be the most important part of a Davenport MBA to your career success. You ll form lifelong associations with classmates who, like you, will become successful business leaders. 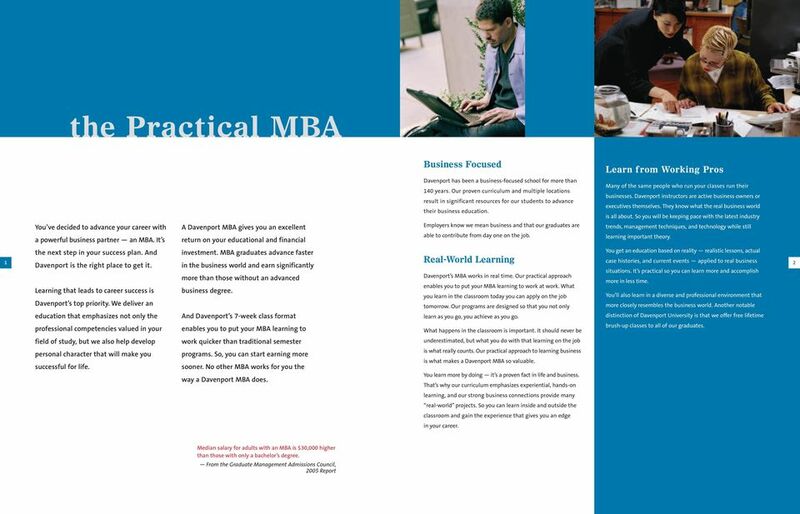 Your MBA classmates and instructors are the most valuable resources that you can draw upon. 6 Getting Your MBA 9 Our Mission Davenport University prepares individuals and organizations to excel in the knowledge-driven environment of the 21st century. In support of its mission, Davenport University: Functions as an independent institution of higher education with a main campus the W.A. Lettinga campus in Grand Rapids, Michigan. Specializes in undergraduate and graduate programs that prepare individuals for careers in business, technology, and health professions. Provides a quality education at the main campus, various off-campus sites and through online programs. Offers educational programs and services designed to serve recent high school graduates, adults, organizations, and international students. Our Vision Davenport University aspires to be a world-class business school, excelling in career preparation, career advancement, and professional development. With its distinguished reputation for mentoring and practical learning, Davenport will teach students to think creatively and recognize opportunity in a dynamic economy. The University will also instill in students an appreciation for civic responsibility in the communities where they live and work. 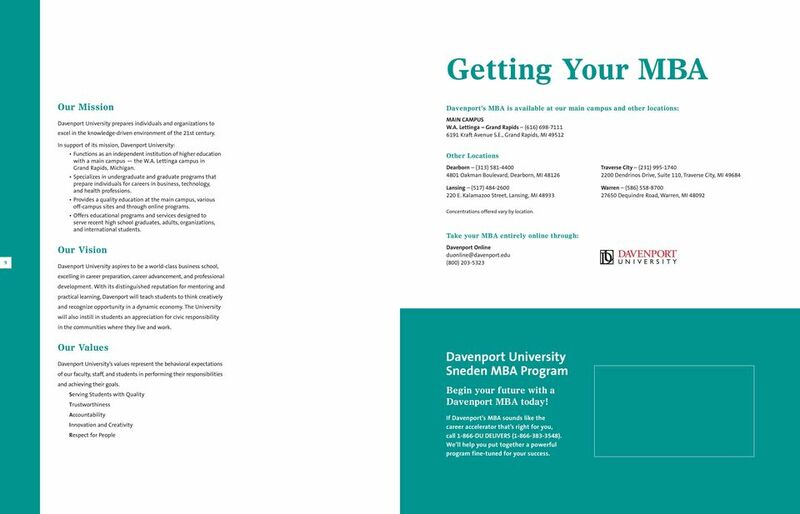 Davenport s MBA is available at our main campus and other locations: MAIN CAMPUS W.A. Lettinga Grand Rapids (616) Kraft Avenue S.E., Grand Rapids, MI Other Locations Dearborn (313) Oakman Boulevard, Dearborn, MI Lansing (517) E. Kalamazoo Street, Lansing, MI Concentrations offered vary by location. Take your MBA entirely online through: Davenport Online (800) Traverse City (231) Dendrinos Drive, Suite 110, Traverse City, MI Warren (586) Dequindre Road, Warren, MI Our Values Davenport University s values represent the behavioral expectations of our faculty, staff, and students in performing their responsibilities and achieving their goals. Serving Students with Quality Trustworthiness Accountability Innovation and Creativity Respect for People Davenport University Sneden MBA Program Begin your future with a Davenport MBA today! If Davenport s MBA sounds like the career accelerator that s right for you, call DU DELIVERS ( ). We ll help you put together a powerful program fine-tuned for your success. Rutgers Professional MBA. Expect More. Be More. Masters of Business Administration DEVELOPING EXCEPTIONAL LEADERS Strategize Manage Achieve The DeVille School of Business Success ACHIEVE YOUR NEXT LEVEL OF SUCCESS You have a desire to manage and strategize. 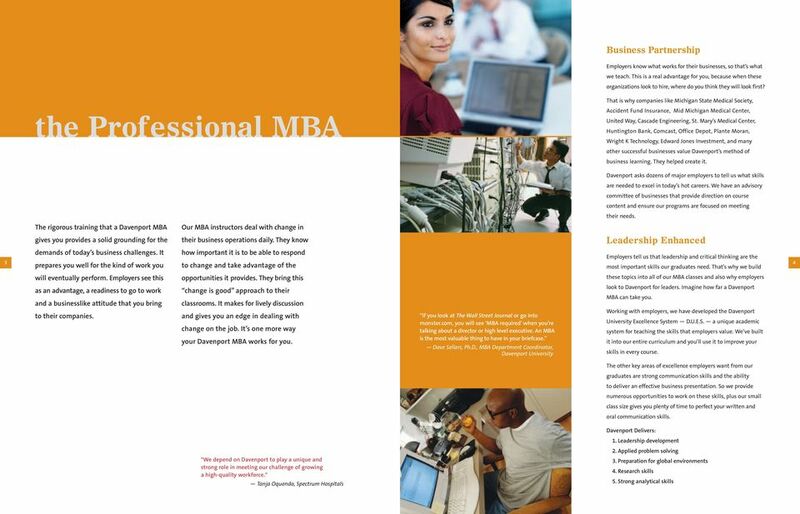 STRATEGIZE, MANAGE, ACHIEVE MBA Masters of Business Administration 1 WALSH UNIVERSITY MBA You have a desire to manage and strategize. A desire to innovate. It s about more than a better job and more money. Evening MBA Program. Leading through innovation. Online Master of Business Administration Lead. Achieve. Succeed. College of Business Online Master of Business Administration Program Ohio University Congratulations on your decision to further your education! master of science in Technology Management This ONE YEAR masters program exemplifies the merging of business and technology and provides you with critical business management skills for future success. Online Bachelor s Degree Completion Program. A Degree Completion Program for Working Adults. Log in to a Distinguished Tradition. Since 1819. Master of Science Degree INFORMATION SYSTEMS. Engaging Minds. Embracing the World.